I still haven't blogged about all my finished projects from 2016 and there is one from 2015, but I thought I'd start the year off on the right foot, so to speak. 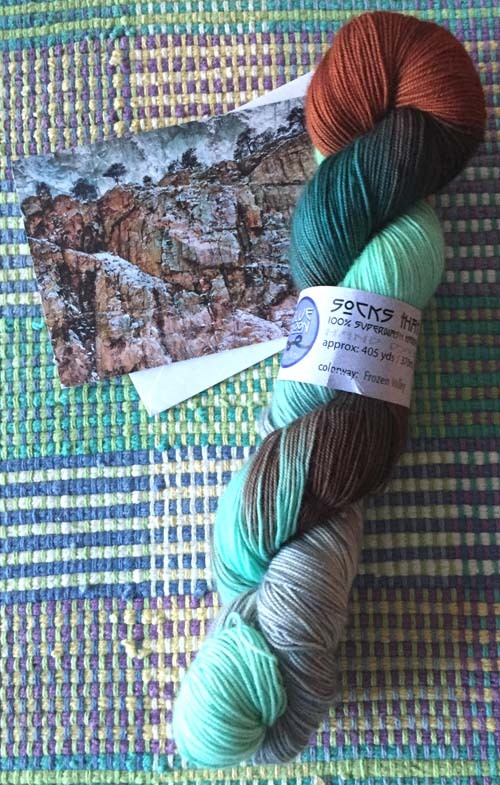 Last year the yarn store, The Loopy Ewe, offered an exclusive sock yarn colorway each month along with a matching notecard. 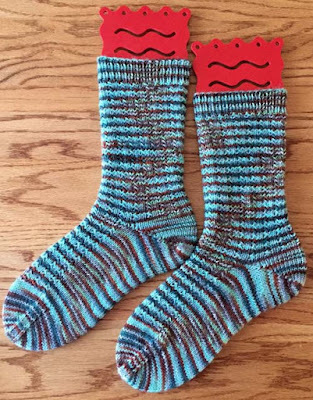 The yarn was dyed by Blue Moon Fiber Arts, the Socks That Rock people. The cards were based on photographs by Image Words of Fort Collins. The picture this month is called Frosty Ridge. 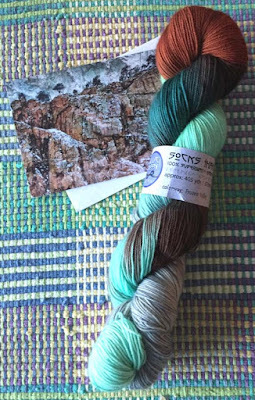 The colors are beautiful and I collected the colors of all 12 months, as did my friend, S.
By the end of the year, neither of us had knit anything with the yarn so we decided to have a little knitalong in which we would make something with the yarn. Starting on January 1, 2017 we would knit something with the yarn from January, 2016 - and so on throughout this year. The goal is to finish by the last day of each month. S. is making a hat. Round 2: *K2, slip 1 purlwise, K1, yo, pass the slip stitch over both the yo and the K1 stitch. I was happy with the results and would use this pattern on another pair of socks. However, for this knitalong, I'd like to try out a different textured pattern each month. short row heel, shaped toe. Note: I had quite a bit of yarn remaining so I've decided to make another pair of socks, Bonus Socks. 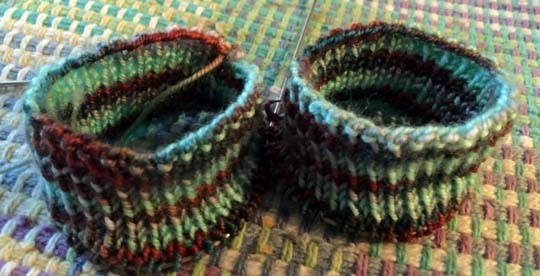 I started with working the cuff of each sock with the January yarn. 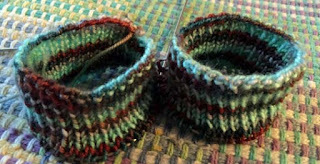 Each month I'll add a stripe with the remaining yarn until, at the end of the year, I'll have a pair of crazy striped socks. The name for next month's color is Bebop. It's bright and colorful and I'm looking forward to knitting with it. Now, to find a good pool-busting pattern to use and then wait patiently for the Feburary 1st cast on.